Children are welcome on all our tours if accompanied by a parent or carer for £29 per child. We accept children from 4 years upwards. 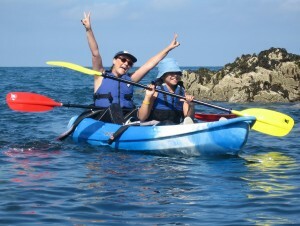 If you are planning to paddle with a young child, we will try to select the best conditions, so they have a great time. This means we may suggest that you rebook on another date, if the weather is not suitable for a young child, even if it is suitable for older children and adults. We have child-sized kayaks, paddles, wetsuits and buoyancy aids available. There is nothing worse than children having to wear poorly fitting (and potentially unsafe) adult-sized equipment. We recommend under 11 years paddle a tandem with a parent or carer. Our child-sized “Kia” kayaks are suitable for the more active young person. 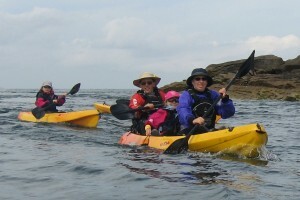 Children can kayak without a parent/carer afloat on our children’s courses. All staff working with young people have undergone a DBS (Disclosure & Barring Scheme) check and follow British Canoeing Child Protection Policies. The adult pays £41.50 and accompanies the young people. Collecting Children from courses: If there is a problem collecting your child then please contact us immediately so that we know what new arrangements you have made to collect your child. If it becomes necessary for staff to wait for someone to collect a child then we reserve the right to make a charge for the time-spent waiting/arranging a suitable alternative. We do not provide transportation to or from venues. School and youth group rates/information. Click here. Take a walk on the seabed. Learn and explore the low water zone with our trained guides. An area that is covered by up to 12m of ocean twice a day. The centre offers a range of activities: Aerial Trekking, Assault Course, Archery, Climbing & Abseiling, Orienteering, Zip Wires, Powerfan Freefall Jump, King Swing and Low & High Development Courses. Plenty to keep your group busy.